Raymond Loewy's autobiography "Never Leave Well Enough Alone" was published by Simon & Schuster, New York, in 1951. One of the original books with a damaged book jacket autographed by Raymond Loewy is at the left. 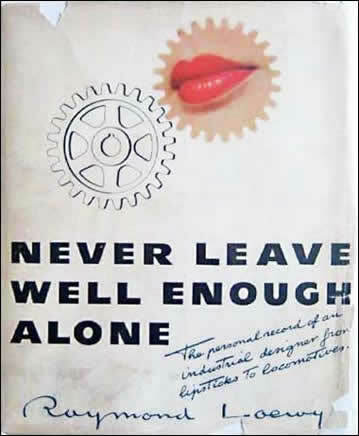 The inscription reads: "The personal record of an industrial designer from lipsticks to locomotives." "The details in this book are amazing … This book serves well to teach how the designs of everyday objects can have an effect on their usefulness, attrativeness, and even potential sales for businesses." – Paul Regna, Avanti Magazine. Below, right is the reissue of the book published in 2002. 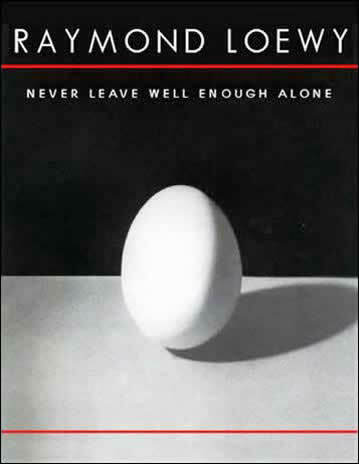 Original first edition of Never Leave Well Enough Alone published by Simon & Schuster, New York, in 1951 and signed by Loewy. Reissue of Loewy autobiography Never Leave Well Enough Alone published in 2002.